(Please click on link above to view the youtube clip of the "Abe Froman" sequence). 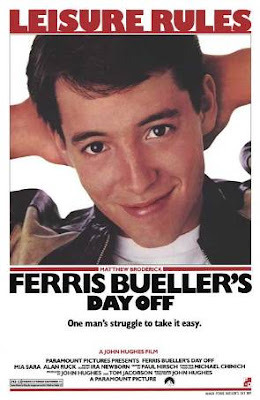 John Hughes' 1986 cult classic Ferris Bueller's Day Off became a manifesto of attitude and destiny for Generation X and the stolen identity of "Abe Froman, the Sausage King of Chicago," is still lovingly hailed by fans to be a great prank against authority. But I think there is far more going on in this scene than we initially recognize: the official tagline, "One man's struggle to take it easy," applied to the entire United States. Original poster reading, "Leisure Rules" at the top. First name first: "Abe," is short for Abraham, who was the father of the multitude in the Old Testament. His last name of "Froman" comes from the German "fro" which means "happy" and "man" meaning person. 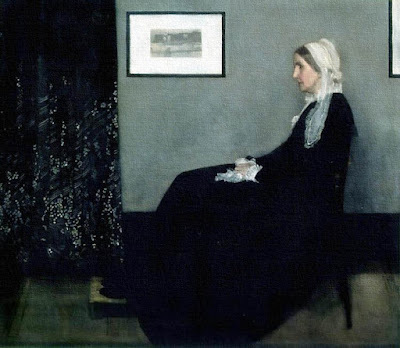 So far, we have, "the father of a happy multitude." 13th Century Russian Icon of Moses, the Law and the Burning Bush. The name "Abraham" suggests a Jewish heritage; if Abraham is a "Sausage King," there is a serious conflict with the Mosaic Law, because pork is forbidden as pigs are unclean animals to the Jewish people. That Abe is the King of sausage in Chicago, means he is a mass producer of sausage, which, in reality, is a bunch of animal by-products stuffed into intestinal casings with herbs and seasonings. So, now, Abe Froman, the Sausage King of Chicago, is the father of a happy multitude who are being led astray to enjoy a food that is forbidden to them. And there is only one man who can fit that description in 1986: Ronald Reagan. Americans in the 1980’s were experiencing one of the greatest periods of economic growth during peace time in U.S. history: personal income taxes were slashed from 70% to around 28%. Now we can understand how Mrs. Bueller’s clients, “the Vermont people,” were able to move to a suburb of Chicago and buy a house expensive enough to earn Mrs. Bueller a sizable commission to buy Ferris a car. This is the whole purpose of the film and the culture it represents: appearances are deceiving, and impersonations are fakes. It's not just Abe Froman who is impersonated: Ferris sings the Beatles, Wayne Newton, Cameron impersonates Sloane's father, Sergeant Peterson of the police, Ferris impersonates Sloane's father, etc., they are all impersonating someone and that translates to being a fake. While the economy looked healthy, it really wasn’t, and while people were spending money, they really shouldn’t have. Like the economy, the closer you look at it, the more it breaks down. 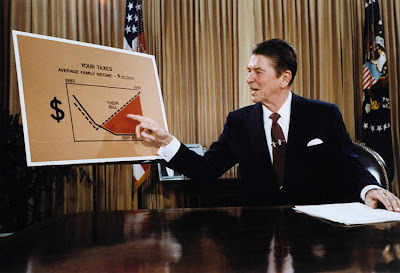 Before President Reagan took office, America was the world’s largest creditor; when he left office, the United States was the world’s biggest debtor: "[T]he public debt rose from 26.1% GDP in 1980 to 41.0% GDP by 1988. In dollar terms, the public debt rose from $712 billion in 1980 to $2,052 billion in 1988, a roughly three-fold increase" (Wikipedia, Reaganomics). If Ferris had been in school that day, he would have learned about the debt piling up, which we are still struggling to pay off, and if Americans had been more attentive to what was going on, instead of "taking a day off" like Ferris and enjoying the extra cash in our pockets, we would have understood what was going to happen, we would have foreseen the disaster we are in, literally, today. Hail to the chief! 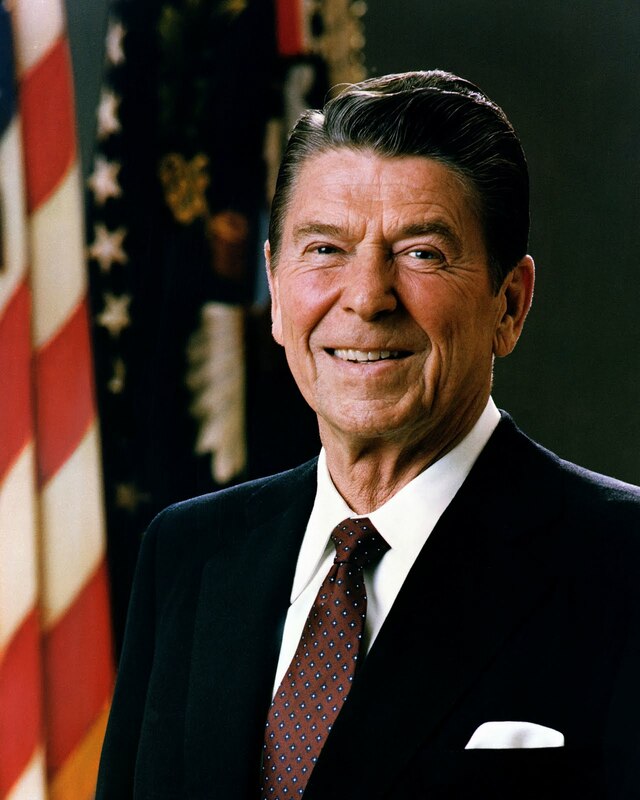 Ronald Regan, 40th President of the United States. Knowing that Ferris didn’t pass out the night before, offers a demonstration that just as information doesn’t trickle down accurately, neither does wealth trickle down. Ultimately, the entire film is a metaphor for Reaganomics. 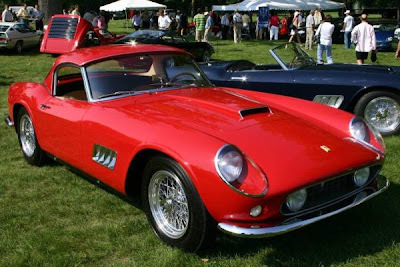 1961 Ferrari 250GT California Spyder, it's so choice. “My father loves his car more than life itself,” Cameron tells Ferris, and it’s for that the Ferrari symbolizes the American economy and it’s fast-paced economic growth: remember Black Friday 1929, and all the stories of people jumping to their death when the stock market crashed? Those people—and Americans still today—are symbolized by Cameron’s father, who love their wallets more than life itself. Ferris Bueller’s Day Off is a doomsday prophecy of what was going to happen to the U.S. economy by showing what happened to the Ferrari. So if people had so much money, what happened to the economy? When taxes are slashed, it does stimulate growth, but the government tends to still spend more money than the revenue it takes in to pay for that spending! What was the government spending money on? If you noticed, the theme song to Star Wars was playing in the background, and it’s a well-directed scene: just as the garage attendants are “flying high” in the car and running up the miles, the American government was spending more than it was taking in on the Strategic Defense Initiative better known as STAR WARS, and that was the cause of the astronomical debt we were heaping up. From a 1984 artist's concept drawing of the Strategic Defense Initiative. I said Americans were experiencing one of the largest periods of economic growth during a time of peace, however, the 80’s weren’t a time of peace: it was a critical juncture of the Cold War with the Soviet Union and the fastest leg of the Arms Race. This important note may--at least, slightly--adjust the way Economists view the Reagan administration. Because of this, we shouldn’t think that the money spent on Star Wars was wasted. Would the Communist Party have been able to keep power without Ronald Reagan having the power of American forces backing him up and pushing them out? He won a war, a cold, silent, expensive war that was invading people’s lives every moment all over the world (and if you don’t believe me, watch another Matthew Broderick flick WarGames of 1983 [which was the role that got him Ferris Bueller] or Red Dawn of 1984 ). But is the Cold War represented in the Ferris Bueller’s Day Off? Principal Ed Rooney (Jeffrey Jones) doesn’t care about Ferris’ future, about Ferris’ well-being or his education: Ed Rooney cares only about Ed Rooney and “not being shown up by a snot-nosed kid,” and that’s pretty similar to the Communists' agenda for taking over the world. 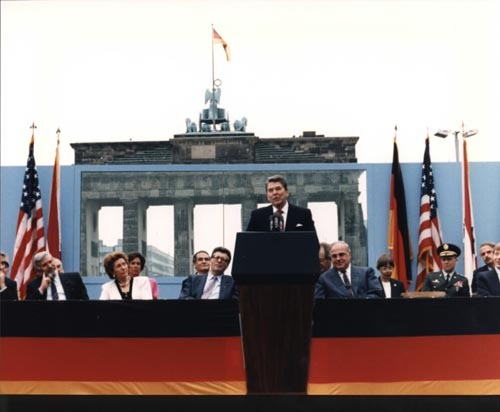 President Reagan speaking at the Brandenburg Gate in Berlin. But Ed Rooney isn't the only person trying to catch Ferris "taking a day off" instead of working; Ferris' sister Jeanie (Jennifer Gray) is "sick" that Ferris gets to ditch school while everyone else has to go. There is a difference though: Jeanie is after justice, whereas Rooney is after power. 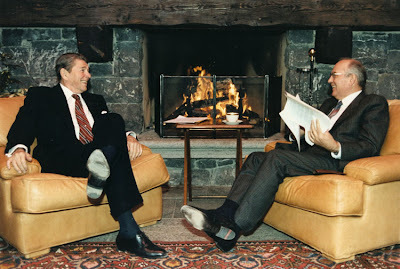 Another big item on the Reagan agenda was, "Just say no!" to drugs, and now we know why. Jeanie must be saved from becoming like Ed Rooney: Jeanie's ditching school throughout the entire film trying to catch Ferris ditching school. The viewer knows that the struggle of "Jeanie becoming like Rooney" is a potential threat because Jeanie and Rooney (in the Bueller household) are "in the same house together at the same time," which translates to them being roughly on the same page in their thinking. Jeanie dials 911 and "makes a call for help," and even though it's not the answer she thinks she needs, going to the police station saves her so she can be the one who "Saves Ferris" from Rooney. 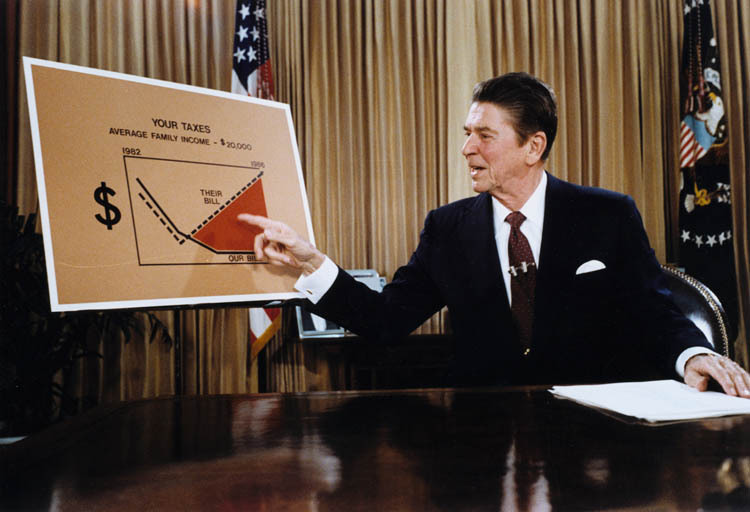 1981, President Reagan outlines his economic strategy to Americans. When Ferris gets home and Rooney "catches" him at the back door, Jeanie tosses Rooney’s wallet to the dog. This is an interesting bit, because where on earth did that dog come from? Has that dog been seen before anywhere in the movie? 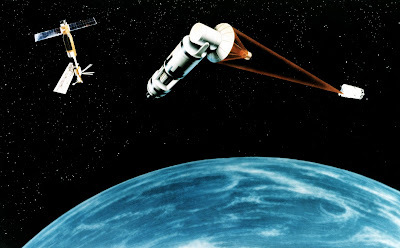 No, it's "an invisible home defense security mechanism," rather like Star Wars. And not only is Ferris saved, but it's a symbol that Reagan wasn’t throwing money away (Rooney's wallet), it was going to our home defense security, Star Wars (the dog), so we would be saved from the Communists. The symbol of the Soviet Union, turned into a gummi bear. As I said, Rooney was after power, so that’s why, in the end, all his dignity is taken from him: his car being towed off (like the Soviet economy), he has to ride on the school bus, a sign that he has to “be schooled” all over again, just like the Communists being schooled in capitalism. What was the symbol of the Soviet Union? 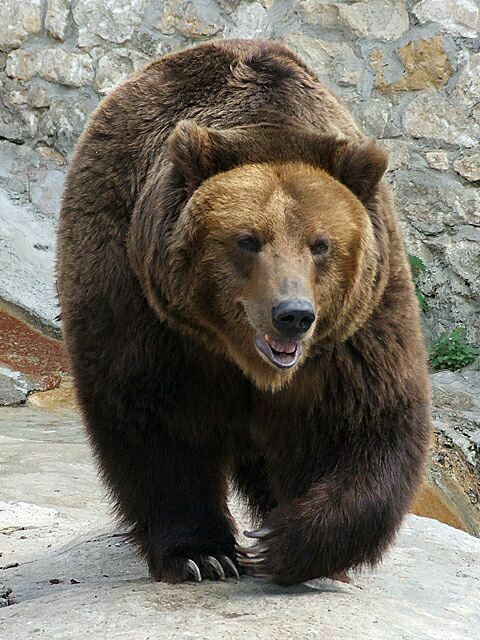 The grizzly bear, and what is offered to Rooney on the bus by one of the students? A gummi bear, because that would be the fate of the Soviet Union, something "warm and squishy." President Reagan and Mikhail Gorbachev, Geneva, 1985. Screenwriter and director of Ferris Bueller’s Day Off John Hughes was definitely a skeptic about Reagan’s “Supply Side Economics,” and his scathing critique of the system was thinly covered by Ben Stein’s brilliant performance as the economics teacher; using a teenager trying to get out of school as a parable for the United States' economy was a brilliant stroke, and it had to be done, because we wouldn't--just like the bored students in the class--listen to what was good for us, we wanted to be out and taking it easy like Ferris. Just like in the story, everything worked out all right, but we are certainly in a pickle now, and the more we get "schooled," the better off Americans and the whole world will be. "Voodoo economics," and "Star Wars," were both derogatory names given to projects in the Reagan administration; perhaps, Hughes wanted "Abe Froman, the Sausage King of Chicago" to be another joke on Reagan, punning off of "pork barrel politics" but I truly think that, given the endearing success of Ferris Bueller's Day Off, all of us are grateful that "we won the struggle to take it easy."